Hey guys! 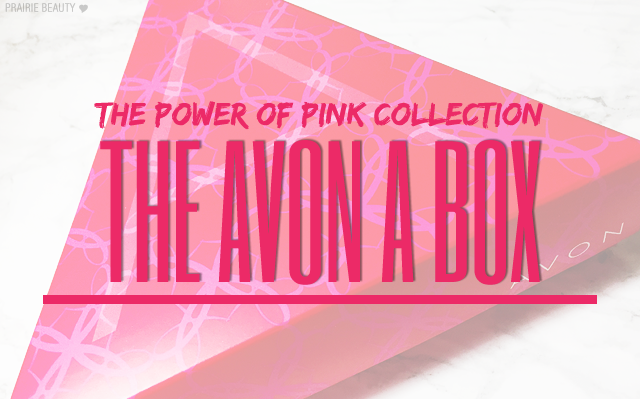 I've got another Avon A Box unboxing for you guys today. This one is called The Power Of Pink Collection* and falls in line with Breast Cancer Awareness Month. I was actually pretty impressed when I opened up this box and saw what was inside - everything pink themed and definitely varied from the last couple of boxes that were a little more similar than I might have liked personally. Keep reading to see what's inside! Prima Eau de Parfum 9ml Rollerball. I absolutely love Avon nail polishes, so I'm happy with pretty much any A Box that contains a polish. I also think the scents were well chosen, both for the body products and the rollerball fragrance. I'm not a huge fan of the Glossy Tube Lip Gloss, I would have preferred one of their Glazewear Lip Glosses personally and maybe in more of a ballet slipper type of pink shade, but it is what it is.